This is the Micro Gripper Kit A, a simple robotics kit that is great for "getting a grip" on smaller robotics projects! Designed for use with any sub-micro size Hitec servo, the gripper kit is easy to assemble and requires only a Phillips Head Screwdriver. 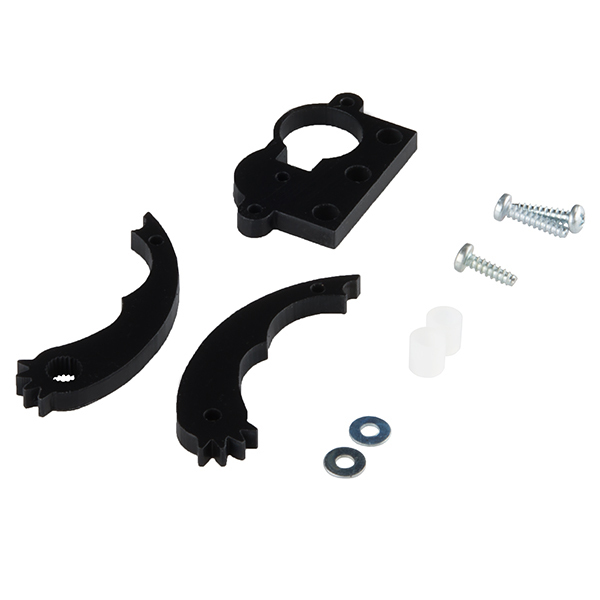 This Micro Gripper is capable of opening 2.75" wide max, has an overall body length of 1.7" long with a 1.3" wide servo housing body, and offers three 6-32 mounting through-holes along the edges of the servo housing. These grippers work just fine but the matching servo leaves a lot to be desired. It would be nice if a higher quality metal gear servo was available for these grippers from Sparkfun. does not work with tower pro micro servo. Arm doesn't fit on servo 'hub'. Tried this with recommended servo, rob-09065 and it fit and the gripper worked ok. This gripper works well! It "splines" directly onto your micro servo, providing great performance - much better than the linkage-based options. But... it's only compatible with certain servos (just like you can't always mix servo horns). It fits the recommended servo, as well as Turnigy and Towerpro nylon gear servos (but not the metal ones, strangely enough). Haven't tested any others.